Stereo microscopes offer low magnification and are perfect instruments for viewing zebrafish in the classroom. Stereo microscopes are sometimes referred to as dissection microscopes because they have a large amount of room to work under the microscope while looking through the eyepieces. Viewing zebrafish under a dissecting microscope is a simple process. 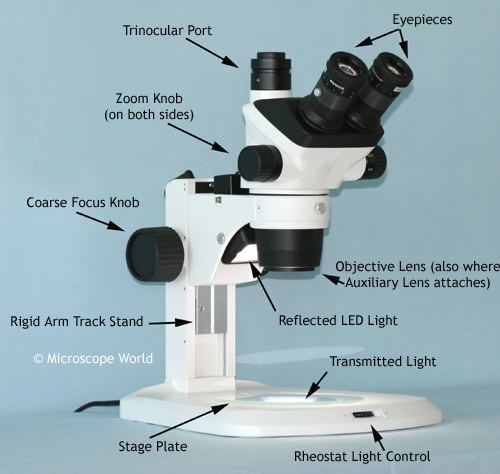 Start by setting your stereo microscope on a flat table with plenty of working room. When viewing stained zebrafish embryos, you will want to use the top (reflected) light source and place your specimen on a solid white stage plate. Your zebrafish will most likely be in a petri dish. Center the dish under the microscope light and adjust the eyepieces so you will be able to look through the microscope comfortably. Start with the magnification at the lowest setting and bring the zebrafish into focus, then slowly increase the magnification. If you are unable to locate the zebrafish, move the petri dish slightly so a different part of the specimen comes into view - it can sometimes be tricky to initially get the zebrafish into the field of view. When viewing the zebrafish with a stereo microscope you will see a three-dimensional round zebrafish. Because the zebrafish is not a flat object, there may be times that not all parts of the zebrafish are in focus at the same time. In order to view the other parts of the zebrafish in focus you may need to adjust the focusing knob slightly. When finished viewing your zebrafish with the stereo microscope, turn off the light, return the zebrafish specimen to its proper location and place the dust cover back over the microscope to keep particles and dust from settling on the optics. Video of zebrafish captured under the HSZ6-TBL stereo microscope.